Unchained – A Powerful Mind – Raise Your Edge! While designed with the poker mindset, you will dive much deeper than just that aspect of your life. Get down to the root causes of the issues that are affecting you. Having the mental toolkit required to compete at an elite level will also greatly benefit your abilities in everyday life. 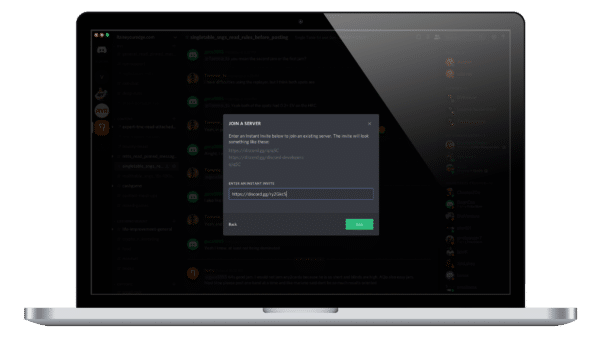 We also have a DISCORD community of over 10,000 like minded individuals to share and discuss. 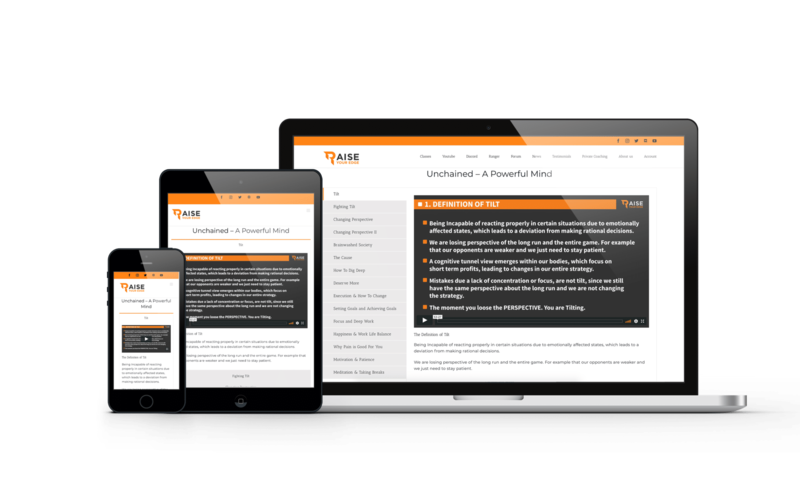 Being an owner of “Unchained – A Powerful Mind” you will also be part of an exclusive private group headed by Bencb himself. You will never feel alone in this journey. I really want you to succeed in your journey and want to ensure you have all the resources needed. We have created a journal to go along with the videos; each section giving you guidance on how to reflect and action. The battle for mindset supremacy can be lonely one, but it’s necessary to put in your own work as each person’s journey is different. With these videos and our guided Journal accompaniment, it’s never been easier to get the most from yourself. By following the exercises I have outlined in the class, you will learn calmness in the most stressful times. Implement new thought processes to bring you to the best decisions in all situations. Perfection is a fool’s goal. This is a journey that really never ends. Through Hyper Self-Awareness you will learn to bet on your strengths and step back and get help where you need it. There are no shortcuts in life. This applies to making money, achieving health goals and definitely not to creating a winning mindset. It’s one of the biggest mistakes people make. Build up acceptance and implement patience. In today’s world its become increasingly tough to focus with the number of distractions possible. The good news is it’s easier than ever to set yourself apart from the masses with just this one skill! It’s time to get our focus back! Sometimes in order to move forward, you need to take a step back. It’s time to reconsider what you thought you knew about mindset. 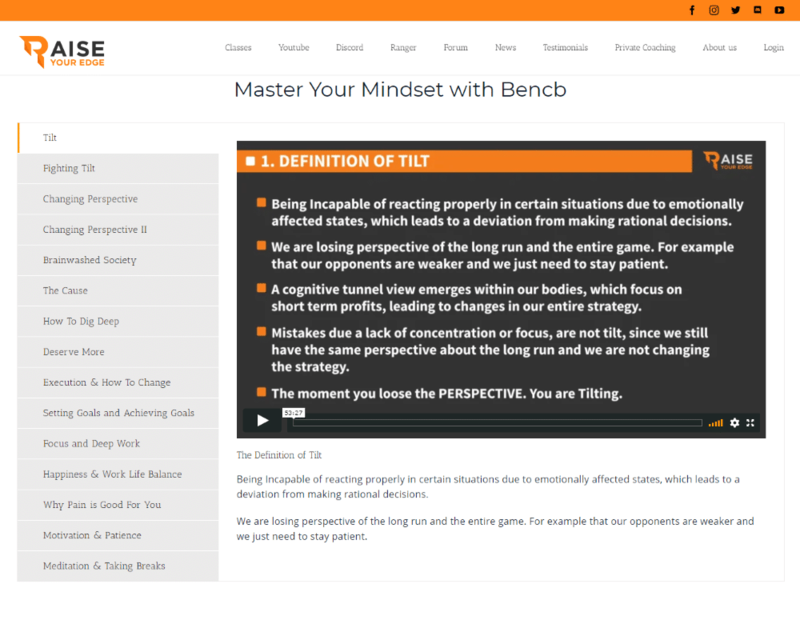 Mindset training is one of the most disregarded parts of elite poker learning. 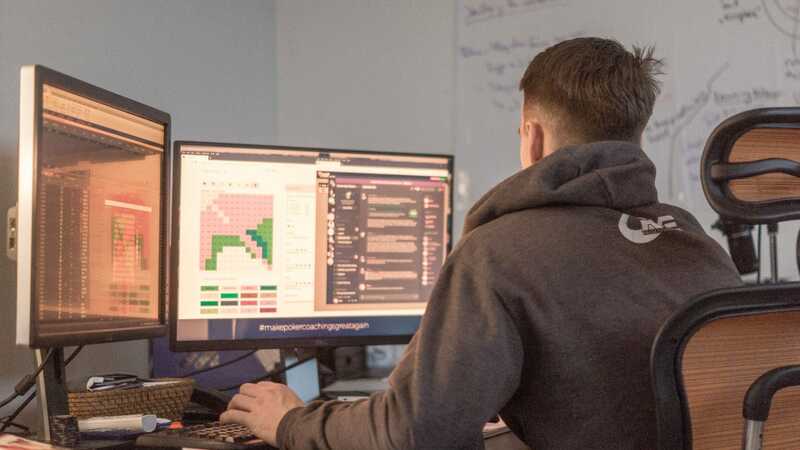 It is easy to see how running sims, putting together ranges along with running equity calculators add value, but the ability to apply these learnings is what separates the crushers from the rest of the field. 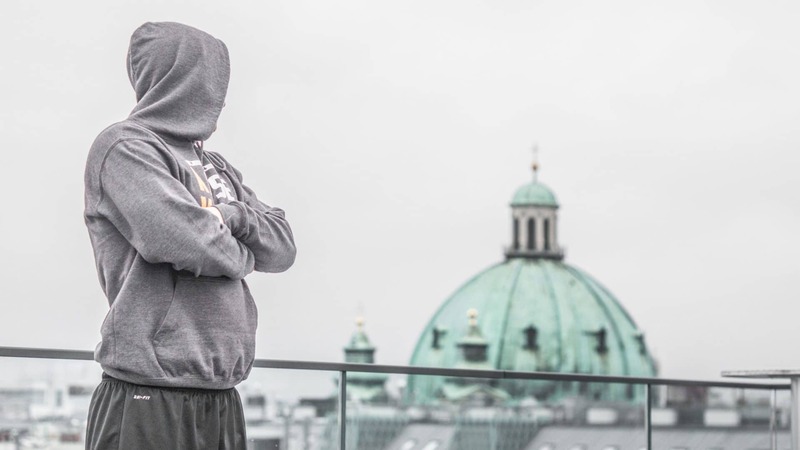 My personal 8-year journey in the poker world was full of ups and downs. The emotions and internal battles that come with this game and everyday life can be overwhelming. I wish I had the knowledge and tools I possess today. With “Unchain The Power” I want to make your journey easier than my own. I want to open your eyes to alternatives, opportunities and help you achieve freedom and happiness. I created this course to help give you clarity and structure. Not only will this help you in poker, but will also carry over into your everyday life. Put into action right away the skills and training to see the changes you want in your poker career and life. Understand in the moment what you are feeling, how it is affecting you and how make rational decisions. Patience, persistence and digging deep are must have skills to excel at any task you want to become elite at. Designed to provide you the tools needed to achieve the success you desire. Ben and Jaime spend the first 10 minutes discussing the importantance of a great mindset in poker. Hey team! Just watched few lessons. And just want to tell that’s the intro cartoons are f*! ?ing awesome! Is it the same guy who does the animation for headspace?Don’t misunderstand me, the content is awesome as well, but after I bought expert class I already knew that this course would be extremely high value !But this approach is really amazing. Your approach for making the course. You could just add few slides with a text, but you decided to spend time and money on it and make it that awesome. Just wanted to say “Thank you!” For your hardwork and passion ! Hello guys just joined the group. I bought the course on 29th Dec. and started on 3rd Jan. Yesterday i watched the last video and i wrote notes after every video + answering the questions from the journal and writing additional stuff. For me the course is a game changer. Very powerful and I am glad that i made the decision to buy it. I just wanted to take the time and thank Ben and his team for the great work. Yes! I want to unchain my Mind! * This price is based on current content. Continuous updates will incur price increases in the future. However, purchase of the course today guarantees all updates are included!